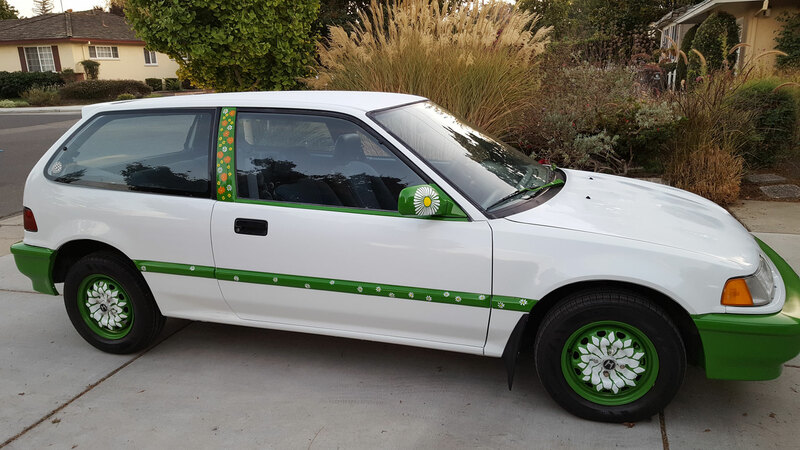 Last weekend I repainted some flowers on my ’91 Honda Civic, Miss Daisy. I’d done this first about 15 years ago, when the car was worth almost nothing, and now again when she is still worth nothing. But she’s worth a lot to me, and maybe even more so because she is not worth much to anyone else, and so I can modify her appearance without regret. There are over a billion cars in the world. The vast majority look identical to thousands of others of the same make, model and year. Most people probably don’t want to modify their cars, even those who lovingly wash and wax them on weekends. But there must be many who would, if that wouldn’t instantly drop the resale value of their cars. We spend a not-insignificant fraction of our lives in these metal containers on wheels, and the car is how many people, especially strangers, “see” us. The most we do is hang a little trinket from the rear view mirror. In a year or five, the car should look as close as possible to how it looked when it left the factory. Any modification should strictly increase its value for resale, even if we never recover the expense of the work. But when can one ever justify actually ruining resale value? Same with houses we own. We not only have to consider our current needs, but the needs of the median buyer who may want to purchase the home years hence. This is not an empty fear. Real estate agents I’ve toured houses with rolled their eyes or chuckled at non-standard modifications, whether it was a converted garage or adventurously placed staircase or extra bathroom. And they would sigh sadly when a house had only 2 bedrooms, or did not meet some other standard requirement. I remember during the dot-com boom someone built a house in Mountain View that had purple turrets and such. Apparently the owner needed to sell it just a short while later, and someone remarked that they expected the owner had a lot of regret about the house. At least most home-building animals, like rats, can make their home to their satisfaction without worrying about whether the rats to move in next will like it. Maybe birds who build for potential partners have it worse, that must be stressful. But for humans, I think it makes us behave like we are just temporarily utilizing the house we own. I once visited a friend who had bought a house in a new development. She explained that she and her husband had bought the big 5 bedroom house 3 years prior and remarked that they had not put up a single painting. Due to her husband’s job they expected to move in another 3 years (which they did), and they wanted their house at that future point to be the most pristine of any house on offer in the same development. She and others have bought big houses, not because they needed the space, but because such houses tend to keep a higher resale value. 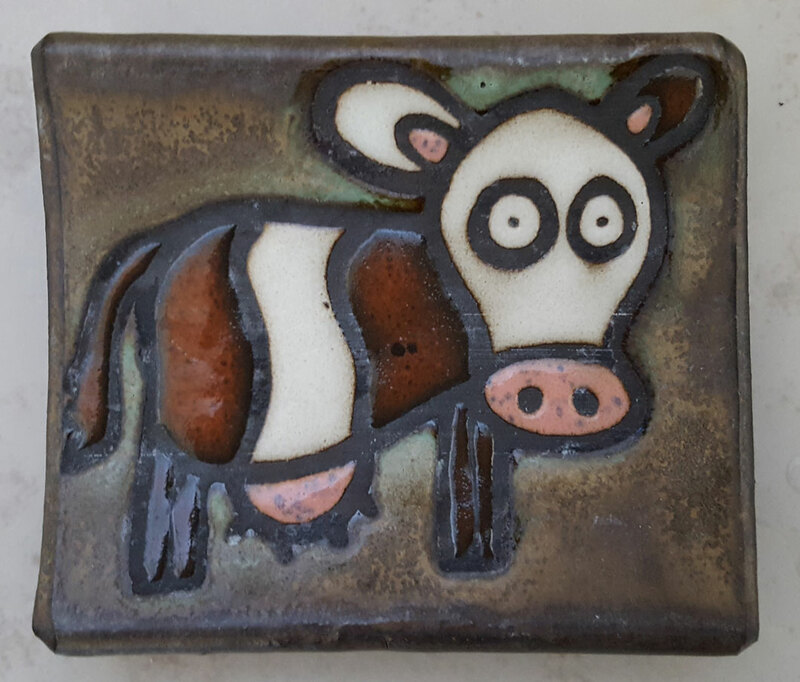 If we ever remodel, I’d like to have backsplash tiles in the kitchen featuring cows being abducted by aliens, something I saw and bought at a street art fair (but now can’t figure out who the artist was). However, I might chicken out. If for some reason we need to sell the house, whether that is the following year or 30 years down the road, will it sell for less because a buyer might not want a kitchen embellished by cows being abducted by aliens? Probably. And this makes me sad. That we are living in tasteful, generic houses, driving generic cars, all striving for the same future salability. Well written and you have a very good point. I think I would like those cows. Also I didn’t know that you painted your own flowers. I should have known. We love them! Tom just said he knew that you painted the flowers and that you returned the car for them to apply clearco. Anyway it looks great and I can’t wait to get a closer look at the wheels! !